I'm surprised I hadn't heard about this site before. Wi-Fi TV offers free streaming content for the iPhone. It includes a few movies and 24/7 live streaming TV channels, such as Cartoon TV, Comedy TV, Sci-Fi TV, Humor TV, and Indy Movies. According to the FAQ, you'll need to register (free) in order to watch for more than five minutes and to take advantage of a wide range of offerings on the social media area of their site. This week I had the priviledge of reviewing the T-Mobile G1. The new phone that runs Google's Android operating system. I'm working up an article focused on product comparisons with the iPhone (and by extension, the touch), but wanted to post a few early screenshots and thoughts. I must say, I regret to have to send it back (it's an eval unit)... The iPhone wins the opening round no doubt, but version 2 of the flexible G1 might be a different story. Read more about G1 shootout...and uh, unboxing! Inside CRM has a great article for business users: 46 Tips for the Business iPhone User. It covers areas of special interest to business users such as productivity applications and resources that are especially useful when you're on the road. In addition to pointing you to useful applications and web sites, there are a few simple tips from a business person's perspective, such as the suggestion that you can use your camera to capture the contents of a white board at the end of a meeting. There is a tremendous buzz in the tech industry about the release of the BlackBerry Storm today which will be sold by Verizon Wireless exclusively. The Storm is a new creation from Research in Motion that is the first touch screen BlackBerry that also has a unique tactile feedback function when you press on the screen. With the staggering amount of press this device is receiving, you’d think it was the hottest item for the holidays. Something Verizon hopes will in fact happen and finally knock the Apple iPhone off of its perch for the first time. I'm American, but as a young budding musician in the 80’s, I was fully on board with English music (especially Punk), my guitar instructor was English, watch more then my share of BBC (young ones!!) and then lived in Oxford for 3+ years. So I can pull a pretty good accent when needed. So after reading this article on Digg explaining how various British accents will give odd results, I just had to give it a try. 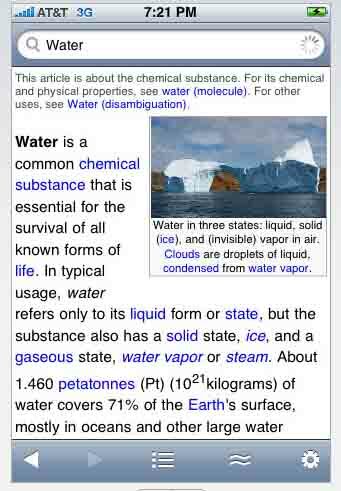 One of my main uses of my iPhone is accessing information on the Internet. When I'm out with friends they've sort of gotten in the habit of expecting me to look up information whenever a question comes up in conversation. Anything from wanting to know the lowest-paid team in baseball (the Marlins) to knowing whether pomegranate is a citrus fruit (it's a fruit-bearing shrub). 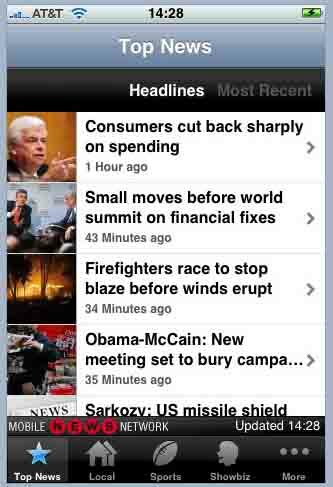 Of the few applications I've tried for reading the latest news, my favorite is AP Mobile News Network. And, with over 700 user reviews on iTunes, it must be among the most popular. Best of all, it's FREE. The latest version has added advertising, but it's not intrusive. The new voice feature of Google Mobile is pretty cool, but so far it seems like it's recognizing my queries only about 10 percent of the time. I found that if I make the query very simple -- like one word -- it seems to work better. Yet I got a result when I said "Weather in Fairfield, Iowa." When I saw the blog item by Matt Cutts on tips for using Google Mobile, I got excited, thinking he'd have tips for improving accuracy. But mostly he deals with other things. According to a recent J.D. Powers study, the iPhone tops the smartphone list with the highest overall customer satisfaction among business users. The Apple iPhone was scored at 778 on a 1,000 point scale and received high marks in the categories for physical design, ease of use and handset features. Following behind the iPhone by 25 points is BlackBerry, which has been the celebrated smartphone amongst business users for years now. Google voice actuated search is out. Go get it. Google voice actuated search is out. Finally. Its pretty good. Works just like in the promo film. A few tips though, make sure you speak clearly and slowly. Do not blur your words together. Another tip, say ‘Maps …. Berkeley’ to get maps up. When you click on the first return, it will give you the option to take that search to google maps. There is a search ‘maps’ option, but it does not take you to maps. Bummer. Read more about Google voice actuated search is out. Go get it. This is just plain sweet. Now first off, I could not get the sync to work for me, most likely because this just came out and servers are over loaded, but I get the idea well enough. Google Earth Now on iPhone! Due to what I imagined must be the enormous computing power required, I didn't think I'd see the day very soon when one of my favorite Applications, Google Earth, would see the light of day on the iPhone. How wrong I was. The wizards at Google have done it again and the results are nothing less than spectacular! Read more about Google Earth Now on iPhone! I found Jott while checking into Google’s new speech recognition app and its not bad.